Pernell "Sweet Pea" Whitaker has joined Zab Judah's training camp to help Zab prepare for his upcoming title fight against Kaizer Mabuza. Judah was frequently compared to fellow southpaw, Whitaker, who was also promoted by Main Events. Whitaker had this to say: "It's the beginning stages, but I am very impressed. I'm impressed with his work ethic. We're working twice a day. I see the change in Zab, he's changed a lot. I remember how his camps used to be, a lot of people around making noise, hollering and screaming. That doesn't happen anymore. He's much more focused." "I'm putting Zab in school again and he's learning it all over again. I'm here to teach and I'm not playing around with him. Zab's got all the skills in the world, we just got to bring them out, get rid of all the bad habits." "We've got a lot of similarities and that's the good part about it. There's always been a lot of me in the kid from the beginning. I'm just here to bring it out. I'm here to bring out the things they said I've done so well and that I know he can do well also." One southpaw working with another southpaw: "That's a big thing. I don't have to be switching it around. It's natural. It' a match made in heaven for me. It's a blessing to be given the opportunity to work with Zab, to put him back on top, put him back in the position that I think he belongs in and to hold on to it. Almost anybody can get a world title, but can you hold it?" "To beat Mabuza, Zab just needs to box. Be a boxer, not a fighter or a brawler. A lot of the African fighters are the same way, they just come to fight, and a fighter could never beat a good boxer. Zab's just gotta be smart that's all. He's got all the skills. You can't make that up." Zab Judah talked about working with Whitaker, "When I was young I was privileged to work with such a great ring technician. 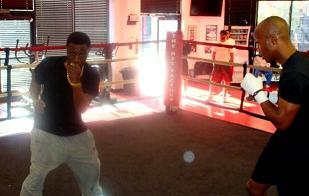 Back then I sparred with him and I witnessed his skill. At this point in my career, Pernell isn't just going through the moves with me, he's explaining the techniques, the how and why. I'm listening, I'm learning. You know, it's like putting a hard drive into a computer; you're just downloading all that information, making it all work. Actually, Pernell and I started working together in about 1990. Now we're just polishing up!" "Pernell is a very talented left-handed person period. It's a different thing working with someone who is 100% left-handed instead of working with someone who switches just for the moment. That person who is 100% left-handed, this is what they do 24 hours a day, so you get the experience from someone who lives it. Some of the moves and things he shows me I can tell that you got to be left handed to pull this off." "We work out twice a day, morning is the boxing workout and then later in the day we do our conditioning. I'm learning the 'Pernell Whitaker secret' to strengthen my legs, its top secret. I feel great. God gave me speed and power, by learning new defensive and offensive techniques from Pernell we're creating an unstoppable force." 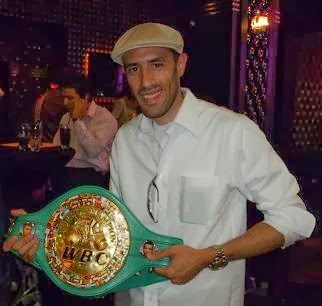 "I say to all my fans, stay tuned on March 5th to see the Zab Judah you love to watch, and to non-believers I say stay tuned and become believers. GODSPEED." Judah (40-6, 27 KOs), will take on South Africa's Mabuza (23-6-3, 14 KOs) for the vacant Jr Welterweight crown on March 5th at the Amerihealth Pavilion at Prudential Center in Newark, N.J. The fight is being offered on Integrated Sports PPV.